Finally a Land Rover for the tech CTO. Land Rover and its family of Range Rover vehicles are known for rugged luxury. You can drive through a river in the woods during the day, rinse it off, and drop it with a valet at the opera that night. It appeals to a demographic that's more interested in the Burgundy region of France and postcards than Burning Man and DMs. So to appeal to the tech CTOs instead of the Wall Street CEOs the company introduced the Velar, its "avant garde" Range Rover. Starting at $50,000, the new high-tech Range Rover -- with a plethora of displays and features -- keeps the driver and passengers connected while pampering them in plush seats with enough room to drag your gear to the beach, mountains or even a certain festival in the desert. To highlight its new focus on technology, the Velar features Land Rover's new Touch Pro Duo dual-screen infotainment system in the center dash. With it you can adjust the climate control, change drive modes, and choose media from the bottom screen while navigating to your destination and keep an eye on the news and weather with the top display. The navigation of both screens is quick to master, with tabs for the main sections always available (at the bottom for the top screen and at the top for the bottom screen). In addition to on-screen menus, there are two knobs on the bottom screen that, depending on the selection, control either the climate, drive mode or seat heater/cooler. While it's great in theory to have physical controls for various settings that are contingent on what's on the display, on a few occasions, I went to adjust the temperature of the passenger cab only to realize too late that I was changing the drive mode from Comfort to Snow and Ice. Whoops. The dash cluster continues the futuristic look with a digital display that's controlled by physical buttons on the steering wheel that change their operation based on what's on the screen. They go from controlling your music, to delving into a huge amount of features for the digital display and how the car behaves. It's in this area where I encountered the most latency while moving up and down feature lists. Nothing overly annoying, but enough to note. The setup also mirrored the issue with the dash with physical controls creating a situation where you believe you're doing one thing (adjusting a feature) and end up doing something else (changing the music). Double whoops. The whole set-up feels like the automaker created it for a concept car, then decided to go ahead and put it in a production car. It's an impressive feat and feels more like the future than many cars on the market including anything from Tesla. I just wish it supported CarPlay and Android Auto since the navigation system doesn't accept voice controls. It's also very dense especially in the dash cluster and I found it helpful to just sit in the driveway and acclimate myself with everything that's possible before adjusting features on the road. And it's on the road where the Velar reveals that it's not just the cabin built for a younger demographic. The Velar feels sportier than the usual Range Rover. You're not going to push it through switchbacks like a BMW X3 M40i, but it handles sharp turns on the freeway without too much body roll. The downside is that that stiffer suspension translates to a rougher ride. Comfort mode smoothes out the bumps, but if the road jostling was reduced an additional 15-percent, it would be outstanding. For those wanting power along with a sportier ride, the Velar comes with either a 2.0 liter 247 horsepower turbocharged 4-cylinder, a 2.0 liter 180 horsepower turbocharged diesel or the 380 horsepower 3.0 supercharged V6. Land Rover sent us the SE trim level (starting at $67,400) with the top of the line engine and yes it was powerful and quick, but there's something weird about a quick Range Rover. 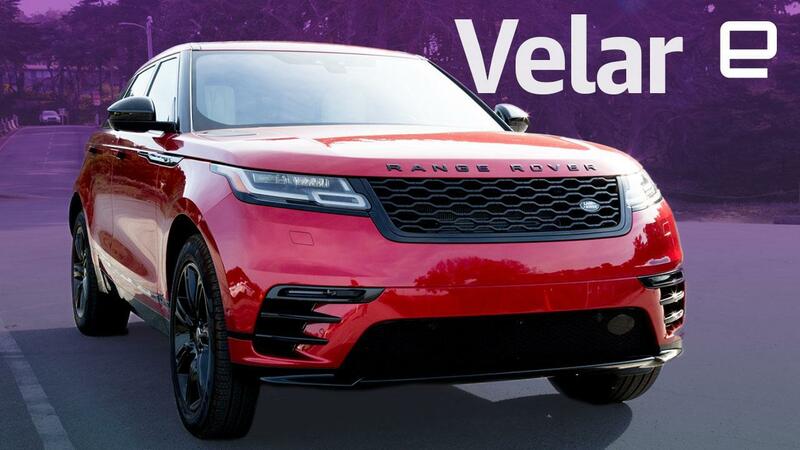 Yes I can see one flying down the 101 piloted by a CTO downing a latte, but I was happy to just cruise in the SUV and enjoy the experience of the Velar. I drove the Velar offroad for a small amount of time. Although it wasn't nearly long enough to gauge the full capabilities of the SUV. I also had zero chance of getting the Velar into any sort of snow and ice. But changing of drive modes was just a few taps away and going from a dirt road to pavement took only a few seconds of adjustment by the car. During the short moments driving through ruts during off-road, the SUV never felt anything other than at home in its environment. Something you can't say for all sport utility vehicles aimed at an upscale market. And the Velar is clearly meant for executives and those with the money and desire for something that's different from the rest of the luxury SUVs in the company parking lot. The Velar delivers with its drivetrain, comfort and with most of its tech. It's a stunning looking vehicle that stands out from the pack with an interior that'll please both the CTO of a tech company and probably more than a few old-school Land Rover fans. It does exactly what Land Rover wants: It bridges the company's rugged and luxurious past with its forward-looking future.